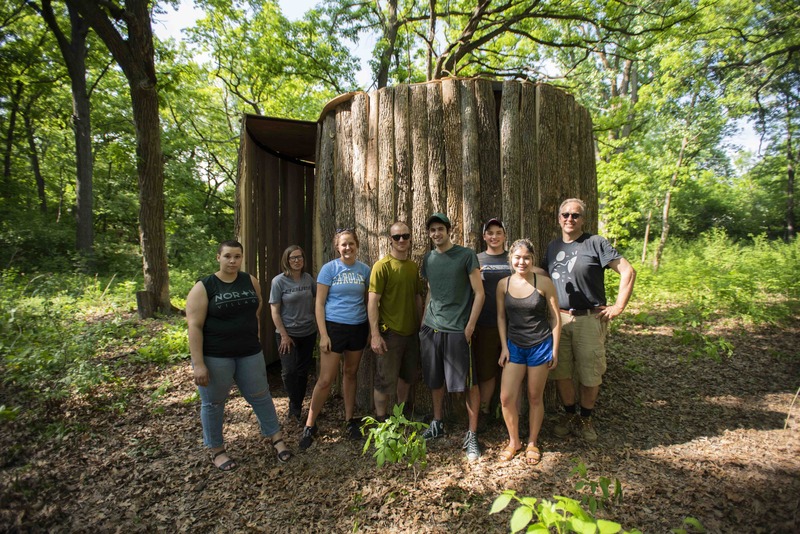 June 22, 2018 | 10 a.m.
"The Archenteron," an interactive piece created by Bethel sculpture students, is on view for a year at Silverwood Park in Saint Anthony. Minnesota. The beauty of the liberal arts is that students are exposed to a variety of disciplines. They can switch or add majors—dabbling in things that interest them—and sometimes that makes for surprising mash-ups of interdisciplinary ideas. To wit: The Archenteron. Students in University Professor of Art Kenneth Steinbach’s spring sculpture courses were tasked with creating a collaborative, interactive piece. Steinbach shepherded students through a creative process and—though he reserved veto rights on ideas that seemed too complicated for the course length or materials available—left decision-making entirely up to students. The 12 in the class had a variety of interests and experience levels and first toured the Minneapolis Sculpture Garden to experience, at scale, how visitors interact with outdoor sculptures, what materials they’re made of, and how they come across as a collection. Early on, the students decided on wood as a medium and humans’ interaction with nature as a subject that would fit well in pastoral Silverwood Park, the eventual location of the piece in Saint Anthony, Minnesota. With a specific space in mind, the students needed the piece to be safe for visitors to interact with and maintenance-free so it could last a year or more in the park’s popular outdoor gallery. “It’s the mission of the park to let people have an enhanced experience with nature; that really resonated with students,” says Steinbach. He explains that for decades, Silverwood has been a place where urban students have been bused to experience nature, sometimes for the first time. Symbolic of what goes on in the wider park, students “wanted the piece to be something that kids could embrace and play with,” he adds. After several iterations, the group landed on a massive piece based on a sketch by Justy LaRue ’19. It has two coils of vertical ash planks covered over the top, creating a central chamber with a winding entrance and exit, explains Matt Bonvino ’20, who was a biology major before he switched to design with an emphasis in sculpture. The piece, to him, strongly echoed anatomy and the organic shapes found in nature. He came across a fitting name while paging through notes from a vertebrate development class he took the previous semester. Rebecca Hed ’21, a fine arts major, says the interactive nature of creating the piece was most meaningful to her; she appreciated the diversity of perspectives from students who all wanted to make something great. “We were all able to have a say in what was being made and combine our creativity to make it happen,” she says. While working on the piece in Bethel’s woodshop, students had to keep the vastness of the sculpture’s final outdoor home in mind. It was built in numbered, ordered pieces that were moved and assembled on-site during Study Day of Finals Week, “like Tinker Toys,” explains Steinbach. He describes the final construction process as communal, celebratory, and also a lot of work, “like an old Amish barn-raising.” Like the journey it’s been on already, the piece has taken on another hands-on, active role at the park. The Archenteron is on view at Silverwood Park for a year or longer. The free outdoor sculpture garden is open 5 a.m. to 10 p.m. daily. The Visitor Center—which has restrooms, a gift shop, and café—is open 9 a.m. to 8 p.m through October and 9 a.m. to 5 p.m. November through March. Sculpture I and Sculpture II students who worked on the piece included Matt Bonvino, Bethany Burggraf, Lauren Cosby, Chase DuBose, Robbie Edwards, Gio Hanson, Reid Harer, Rebecca Hed, Justy LaRue, Petra Lee, and Bella Williams. Find out more about Bethel’s art and design programs.